Credit is one of the key tools for playing offense The Joseph Group uses in its asset allocation strategies and represent an important slice of the pie chart for clients in our Harvest and Provision strategies. In general, Credit is a catch-all term for bonds with below investment grade credit ratings. Examples include high yield (“junk”) bonds, bank loans, convertible bonds, and emerging market debt. Let’s focus on high yield bonds and unpack why JPMorgan is finding them attractive in the current environment. Part 1 – Risk Free Rate: As of March 20th, the 5-year U.S. Treasury bond rate is 2.41%. This rate represents the interest an investor can earn on a “risk-free” basis. Since Treasury bonds are backed by the full faith and credit of the U.S. government, investors can be reasonably confident if they buy a 5-year Treasury bond, they will earn 2.41% each year for the next 5 years and then get their money back at the end. Putting these together, an approximate current interest rate investors may earn through high yield bonds is the Treasury Rate + Spread, or (2.41% + 3.91% = ) 6.32%. In the current environment, JP Morgan’s hypothesis is that stock and high quality bond returns will be somewhat flat, but the economy should be stable. If they are right, earning interest of over 6% in high yield bonds is attractive. It is worth noting, while high yield bonds may pay an attractive rate of interest, their prices can fluctuate. This means overall returns can be different than the interest rate, especially in the short run. For example, in the 4th quarter market sell-off last year, high yield bonds were down -4.4% for the quarter, wiping out their gains for the year. Investor perceptions of risk changed and the spread investors demanded as compensation for default risk increased, leading to declines in bond prices. 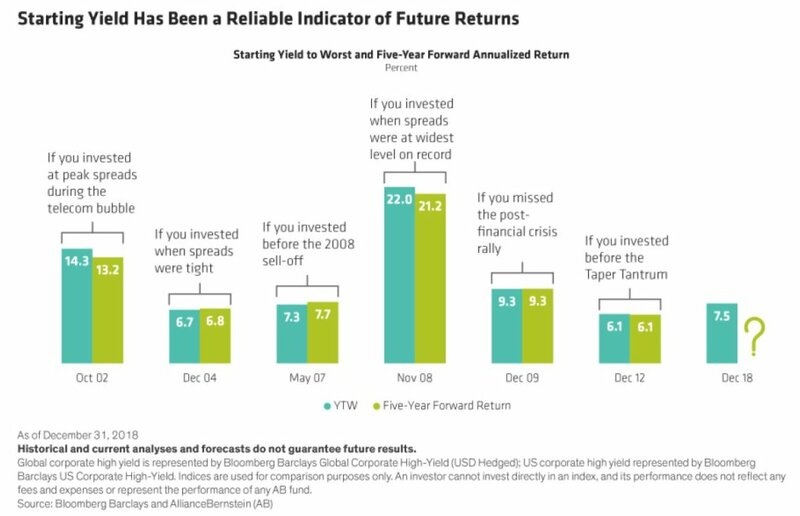 Over the long-term though, the current interest rate (aka, starting yield) has been a good proxy for future returns. The chart below, from AllianceBernstein, shows the starting interest rate for high yield bonds in different historical periods and the annualized return 5-years later. While the numbers vary slightly, they are still pretty similar. 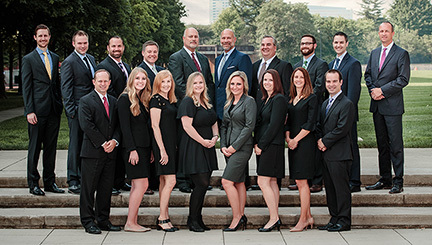 So, is The Joseph Group increasing its exposure to high yield bonds in client portfolios? Not yet. While we are intrigued with JP Morgan’s view, our asset allocation discipline is to overweight Credit when the “spread” (amount of interest earned for bearing default risk) is above 5% and underweight Credit when the spread is below 5%. Historically, when spreads have been above 5%, forward returns of high yield bonds rival that of stocks. On the other hand, when spreads are below 5%, credit is flowing freely through the economy and stocks tend to be the better play for offense. If we see spreads increase, we would happily shift additional exposure to Credit to take advantage of lower prices in high yield bonds. Right now though, we plan to keep some of our dry powder and look for high yield bonds process to get cheaper before we make a bigger allocation.